Travel deep inside a lush blue lavender field in the heart of Provence, France and bring back the unmistakable intoxicating and relaxing fragrance of Provencal lavender (lavendula). 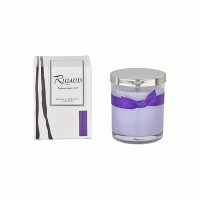 Lavendula is a new and exclusive introduction by Rigaud Paris for Rigaud Paris candle collectors within the United States. Take your favorite candle with you wherever you go knowing that it is always protected within its little aluminum box and cap decorated with its exquisite vintage Rigaud black and white pattern. 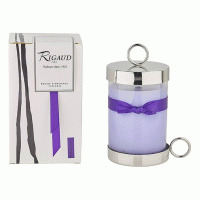 Founded in Paris in 1852, the house of Rigaud is one of the oldest perfumeries in the world. 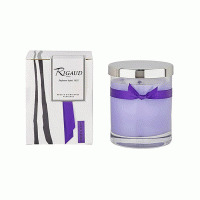 Rigaud Paris home fragrances are timeless and classic and this Lavender introduction is no exception. 35 hours of fragrance. 100g of exclusive soft wax. Pure cotton wick. A RELAXING PROVENCAL LAVENDER transports you knee deep into the endless fields that define Provence. 35 HOURS OF FRAGRANCE IN A LIGHT, UNBREAKABLE ALUMINUM CONTAINER ensures travelers never go without. BIODEGRADABLE CLEAN BURNING SOFT WAX LIQUIFIES AND DIFFUSES FRAGRANCE QUICKLY, burns slow and even. 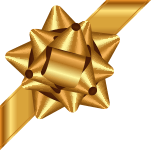 HIGHLY CONCENTRATED WITH MORE FRAGRANCE THAN AN EAU DE TOILETTE releases fragrance when not burning. 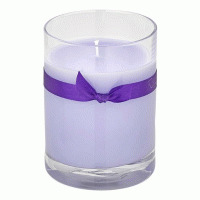 INTRODUCED FIRST SCENTED CANDLE IN 1957, founded in Paris in 1852 and one of the oldest perfumeries.